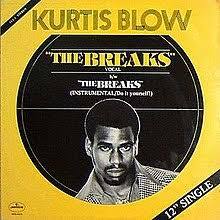 “The Breaks” is a 1980 single by Kurtis Blow from his self-titled debut album. It peaked at #87 on the Billboard Hot 100. It was the first certified gold rap song for Hip-Hop, and the second certified gold 12 inch single in the history of music. In 2008, the song ranked #10 on VH1’s 100 Greatest Hip-Hop Songs. The track hit #4 on the U.S. Billboard R&B chart, and #9 on the U.S. Billboard dance chart. The song has also featured in few video games: the 2002 game Grand Theft Auto: Vice City, the 2005 game True Crime: New York City, the 2006 game Scarface: The World Is Yours and 2011 Kinect game Dance Central 2.